The safest, and most natural way to keep your hands germ free. This vitamin based hand sanitizer is USDA certified organic, and able to kill 99.99% of all germs. It contains no harsh chemicals, no alcohol, and has basically no scent. It is also free of Benzalkonium Chloride which is a common ingredient in other alcohol free sanitizer products. HandSan features a liquid solution that is dispensed as a fine, misty spray. This ensures even and complete coverage, but also makes it incredibly easy to use. It comes in a smaller container that is perfect for taking along with you, yet big enough to also leave any place you will use it most. Despite the compact container, this amount will deliver up to 150 applications. Safe for children, pets and the planet, this organic hand sanitizer is tough on germs while remaining gentle on your skin. It doesn't contain harsh ingredients that will dry and ruin your hands, but it is still just as effective as any of those regular versions you see at the store. It gets its power from a vitamin packed solution full of natural, germ fighting ingredients. It is a nutraceutical grade sanitizer, and contains no artificial preservatives. 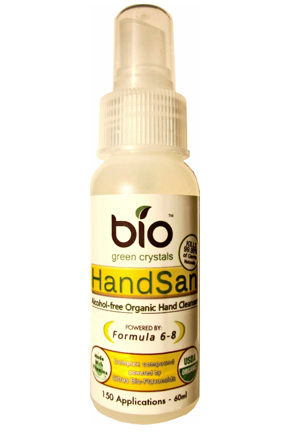 HandSan is comprised of organic, complex bio-flavanoids, organic acids, vitamins and water. It is all natural and safe for the environment and incredibly effective so you can feel confident every time you spray it on. With no harsh chemicals, added fragrance or anything else unnecessary, HandSan is allergen and perfect for anyone with sensitive skin. As an added bonus, it is also packed with antioxidants and beneficial vitamins that will nourish and protect your skin. Stop using dangerous products to rid your hands of germs. You don't need to dry your skin or smell unpleasant perfumes to prevent the spread of germs. This organic hand sanitizer gives you all of the benefits, and eliminates the down side by cleaning your hands with safer, more natural ingredients. Simply pump to dispense the cleanser. It comes out as a fine mist to provide maximum coverage and to allow for a more even application. This small container will pump out up to 150 uses. Once applied to your hand, simply rub both hands together to clean and kill germs. Once the moisture is gone, you can stop rubbing because your hands will be clean, and 99% of all germs will be dead or otherwise eliminated. There is no rinsing necessary, and you will not need a towel to dry off. This gentle, yet powerful solution quickly neutralizes germs and leaves your hands feeling great. It contains no fragrance, harsh chemicals, or toxic ingredients. Your hands won't smell fruity or pine scented after you are done, and your skin won't feel dry and cracked the next day. With HandSan you will kill germs and help to prevent the spread of yuckiness and germy bugs without the ill effects that come from using the ingredients in other similar products. Most other hand sanitizers contain ingredients that you may not want to put on your skin. They will produce similar results, but the drawbacks can be plentiful just based upon what is in them. That is why this organic alternative is so great. It uses a complex compound of vitamins and bio-flavanoids to do the killing, so you don't have to think twice about rubbing it into your hands. The majority of hand cleansers out there will contain alcohol as an antimicrobial ingredient. Some other, more natural, alcohol-free versions will use Benzalkonium Chloride as an alternative to alcohol for the same reason. This can be a much safer ingredient that is easier on your skin, but it is not completely ideal for all people. Alcohol, when applied to the skin, strips away natural oils so aloe or some other type of moisturizer is often added to counteract this effect. When alcohol is included, it also leads to the addition of fragrance and perfumes to cover the smell. Benzalkonium Chloride can be dangerous for people with asthma or skin conditions such as eczema, so although it can be considered a safer alternative to alcohol, it is not perfect for everyone out there. Certain natural hand sanitizers may forego both of these ingredients, and go with thyme oil instead. Thyme oil posses very strong antiseptic properties which makes it effective, but it should not be used by pregnant women, and others may find it too strong to be used externally. HandSan is a safe alternative to the safe alternatives already out there. It does not contain any chemical or ingredient known to be harmful to humans so anyone can use it as a safer and more effective alternative. This natural and organic hand sanitizer is perfect for anyone, but ideal for those with small children. Due to the consistency of the solution, as well as the delivery method, this hand cleanser is quick and easy to apply. A single spray will cover your entire hand, and allow you to clean and kill germs fast. As a parent, it is great to have a product that is quick and easy to use, but also incredibly safe. You can spray this on a child's hands in a matter of seconds, and you will be sure that you have covered their whole hand. You will also be able to remain worry free because it can not harm them like other versions may. From playgrounds to shopping carts, your kids touch germs all day long. Spritz them with this safe sanitizer and you will prevent the spread of germs and cut down on the amount of colds they catch. Switch to this alcohol-free, organic hand sanitizer to be more green, and gain all of the benefits of not using harsh cleansers to kill the germs on your hands. The vitamin solution in this bottle is just as deadly to the germs, but far less harmful to you. It is easy to use, highly effective, and it doesn't have any kind of offensive odor or perfume scent. It comes in a convenient size that is perfect for at home, at your desk, or with you on the go. Fragrance free, preservative free, no added colors and free of all those harsh ingredients other products use. HandSan is the ideal alternative for anyone. Get up to 150 uses with this one container. Ingredients Organic citrus extract bio-flavanoids, organic acids, organic rosemary, vitamin k-2, ubiquinol and water. Clean your hands and kill germs the safe way! This hand cleaner is free of any harsh ingredients, works great and is safer than traditional products. Get the same results without any worry or harm. Order Yours Today! Can I get bulk quantities of this? I am interested in a gallon. We only have this size right now. We would not be able to ship a gallon jug, but we could offer a better discount for larger quantities than what is listed.